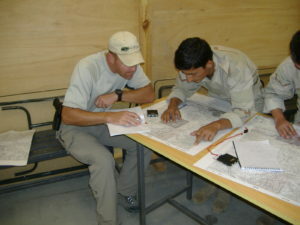 Philip McTigue instructing Afghani Police Officers on the use of maps and imagery in Kabul Afghanistan 2006. Imagery has become a commonly used product for everyday functions such as using Google or Bing maps or even street view imagery, in order to find directions or view current surroundings. This expectation of imagery has migrated to professionals who serve in the military and first responders reacting to critical incidents domestically. With technical advances in the methods imagery is collected, the capability of orthogonal imagery is now being challenged by new oblique imagery. This new oblique imagery replaces natural perspective to imagery making it functionally easier to use and interpret. While imagery is still being collected by satellites these platforms for collecting imagery are also being challenged. Now imagery can be collected at a very high resolution from low flying aircraft, or unmanned aerial vehicles. This new high resolution oblique imagery can be updated frequently giving our armed forces and first responders critical information they need. GIS experts, like Philip McTigue, have noticed that technology is being improved almost quicker than it can be integrated and used by our assets on the front lines of both domestic critical incidents and international theaters of operation. One facet of this constant evolving technology is imagery. Earlier in Philip McTigue’s career, imagery was collected by satellites flying thousands of miles over the earth’s surface in order to give command elements situational awareness. It was not long ago that U2 spy planes were the newest technology capturing images flying in high risk locations to gather this data quicker and faster than satellites. Recent advances in technology now provide Philip McTigue and others the ability to collect high resolution oblique imagery and transmit the data in real-time from the aircraft not only to the command elements in the rear, but also to the forward commanders at the battles edge. This technologically superior imagery is often acquired, but not made readily available to the operators who need it most. Oblique high resolution updated imagery is a key element to successful battle, critical incident response and mission planning and needs to be available to operators and first responders quicker and more efficiently. Society has come to expect having our desires fulfilled easily and immediately. Favorite movies now debut at midnight the first day they are shown in theaters, favorite football teams can be seen live on any television with satellite service on Sundays, and our favorite music can be downloaded from the internet immediately while we are driving our vehicles. Smart phones now give us immediate answers to our troublesome questions, they talk to us, our cars take verbal commands from us and communication is now instant from texting family members to announcing our current activities to the world via Facebook. It was not long ago the military veterans of Desert Storm in 1990-1991 traversed deserts with only commanders having a new technology called Global Positioning System (GPS). Philip McTigue served in the Marine Corps during the Gulf War and remembers this time very well. Now parents taking their children to soccer practice have GPS built into their vehicle while their phone serves as a secondary GPS. Bob LaCava, a veteran of Desert Storm tells a story of his experiences with the United States Marine Corps while serving in the desolate deserts of Saudi Arabia prior to the invasion of Kuwait saying, “We had to go to an AT&T tent set up in the middle of nowhere with huge satellite dishes to make a phone call home. The delay in the signal was awful, something like almost three seconds, so you were constantly talking over each other…” (B. LaCava, personal communication, March 10, 2013). 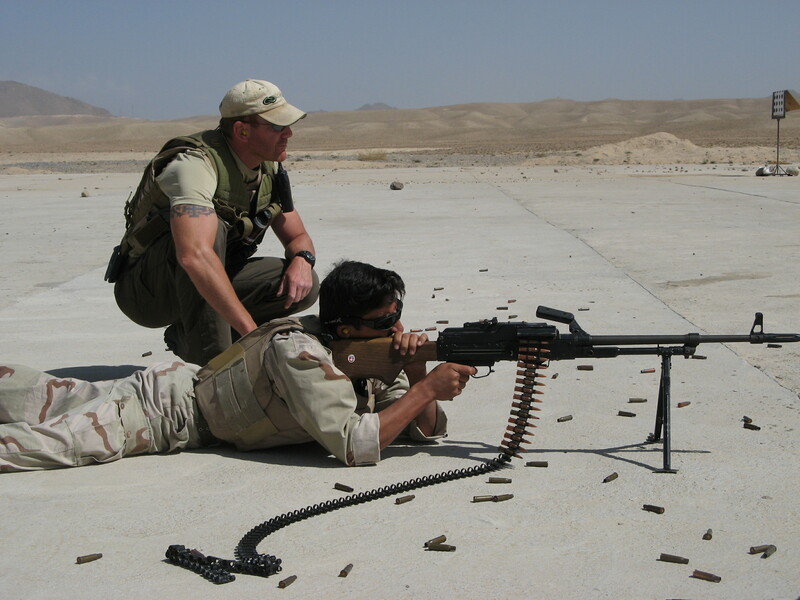 Almost twenty years later in 2009 Mike Davis was working for the DEA Foreign-deployed Advisory and Support Teams (FAST) in Kabul, Afghanistan. He recounted quite a different experience explaining, “I had a cell phone that I could call home with anytime, my wife could call me and it sounded like she was right in theater with me…the reception was so clear…” (Michael Davis, personal communication, March 17, 2013). As advances have been made in the technology for GPS and communications, so have the advances for imagery. We now see the use of imagery in nearly every aspect of society. Gone are the days of U2 flights; now the use of Google maps and Bing maps has evolved imagery into an expected commodity including street view images and imagery for such places as skiing mountains and walking paths at colleges. Whether an internet user is looking for a local restaurant or the hotel they will be staying at during a vacation, imagery is both expected and demanded. This same expectation for imagery can be found in today’s military and first responders. It is hard to expect the understanding of a citizen who can look at both aerial imagery and street view imagery of their local businesses, yet while deployed to battle fields they cannot see any imagery of the village they are required to patrol. Likewise, in the event of a domestic critical incident, ranging from acts of terror to acts of God, first responders and emergency personnel require updated imagery of the scene they face for proper response coordination. Romanowich (2013) writes about securing airports and the importance of thermal imagery combined with visual detail saying “Knowing the size, location and nature of an event…is the key to mobilizing an effective response” (p.13). These words are continually echoed by armed forces personnel and first responders who cannot afford to be hampered and blinded by a lack of imagery for the environment they are expected to operate in. However, GIS experts like Philip McTigue say that satellite and aerial orthogonal imagery is still a staple being provided to governmental agencies as well as local governments across the country. Satellite imagery is captured using a satellite as the platform for the imagery sensors or ‘cameras’. Aerial imagery is generally still orthogonally captured, however rather than being collected using a satellite as the platform, an airplane is used. These aerial images can be collected from a vast array of platforms to include high flying or small low flying planes to include unmanned aerial vehicles. This orthogonal imagery has also seen its technology vastly improve as resolution now is commonly collected at half meter to as little as three inch ground sample distance (GSD). Ground sample distance is defined as the area of ground represented by one pixel in a digital image. Satellite imagery has advantages as satellites can still acquire imagery in locations that are high risk or difficult environments to fly over. This orthogonal imagery is valuable for disaster relief efforts, but can also be used in many other ways. This imagery can be used to predict potential locations for natural disasters; watershed and drainage issues, flood mapping and analyzing and identifying specific weaknesses in critical infrastructure (Crandall, 2010, para. 6). An example of this use for imagery is the Nashville flooding of May 2010. Historic flooding occurred in this area and first responders needed updated imagery to see where they could move assets and deploy rescue personnel. A company was contracted to fly over the flooded locations and within days the geographic information system (GIS) Director for the Nashville Metropolitan Planning Department Jennifer Higgs reported, “…the data was streaming in…we had what we needed and we immediately started printing maps for the fire department” (Corbley, 2011, p. 26). This same orthogonal aerial imagery has proven useful to our military forces in both Iraq and Afghanistan (Peck, 2004, para.21). Sandy Jacks, NGA Commercial imagery Program Manager, explained imagery was used for planning and adding data to databases for the military as well as identifying enemy targets (Peck, 2004, para. 22). Although orthogonal imagery has proven to be useful to our first responders and armed forces it has significant weaknesses. Perspective in orthogonal imagery can be confusing to end users who are not image analysts. By definition, orthogonal is ‘intersecting or lying at right angles’ (Merriam-Webster, 2011) which when applied to imagery science means the viewed image has been taken looking straight down. This means buildings are viewed only seeing their roofs with no perspective on building height. This same principle can be applied to such objects as fences, light poles or cell tower antennas. Unlike someone like Philip McTigue who works with this technology, the general population is not familiar with looking at anything from this unnatural and confusing perspective. We visually understand our world from a ‘street view’ aspect including a 3 dimensional perspective. Additionally it is hard to identify objects in an orthogonal image. For instance if a police officer were looking for a red house described as a ranch type building with a large screened in porch and a tall wire mesh fence around the property it would be almost impossible to locate the building in an orthogonal image due to the perspective of the photo. The orthogonal perspective would mask the ability to see the color of the house, the amount of floors the house had, if any of the house was screened in as a porch, or if a fence was wood, concrete or mesh. These same hurdles can lead to a lack of actionable intelligence from imagery for the military personnel deployed to conflict zones. If a soldier were to be going on patrol in a village in Iraq and imagery for the village was studied, there would be a lack of powerful information from an orthogonal image. Key tactical information such as the height of the brick walls separating residences from the roads and pathways and the height of some buildings being higher than others would not be discernible. Where might an enemy shooter find the high ground on top of a structure? Is a wall high enough to protect a vehicle or a patrol from a potential blast or rocket attack? This type of information is pertinent to the safety and planning of a mission whether it is patrolling in an unknown theater of war or responding to a critical incident domestically. These obstacles for orthogonal imagery are further complicated by the vast amounts of data and imagery being collected as Lt. General David Deptula has famously said “We are swimming in sensors and drowning in data” (as cited in GE Intelligence, 2012, p. 30). However imagery must be relevant and constantly updated to be of value. If the same soldier referenced above is doing a map study of a village he is going to patrol, he cannot use imagery from two weeks ago as the obstacles he may face will have been moved. Col. Darrell Lance, Director of the Army Space Program says, “We need direct downlink. We need direct access to that data…” (Diamond, 2001, p. 6). This is another common request and absolute necessity for military assets and first responders. Having imagery that depicts an environment incorrectly is actually worse than having no imagery at all. This problem is acknowledged by Michael Rodrigue who is the Deputy Director of the National Geospatial-Intelligence Agency. Mr. Rodrigue explained in an interview that “Getting solutions to the field fast is the key to successful wartime support” (Geospatial Intelligence Forum, 2013, p. 19). The orthogonal imagery loss of perspective coupled with outdated or old imagery for our first responders and military is a problem that has answers, yet this technology is slow to become part of the work flow for these personnel. Oblique imagery is imagery which is captured from aerial platforms similar to those same platforms as orthogonal imagery, but instead of looking straight down the camera has been angled in order to capture a more natural perspective. Oblique imagery is typically captured at a forty to forty five degree angle thus placing natural perspective back into the imagery. In the above example, now that same police officer can see the sides of buildings in imagery allowing for recognition of the red house being looked for. Additionally the officer can see from the oblique angle of the imagery that the house is a ranch and has a screened in porch. Due to the high resolution of the oblique imagery it is clearly noticed that the fence is a chain link mesh fence. Oblique imagery is readily available to most local governments by commercial flyers and is currently used by thousands of counties domestically (Dunker, 2012, para. 2). Sgt. Shaun Welch, a Webster New York Police Officer has used oblique imagery from Pictometry for his daily duties for years and expresses the utility of this imagery by saying, “The offset imagery…there is nothing better…I can see and relate to situations better with it” (S. Welch, personal communication, March 10, 2013). For natural disasters having the ability to quickly assess damage is essential and imagery has played a key role in these events. However the limitations of orthogonal imagery have often failed to effectively help in this situation. However with the use of oblique imagery this type of critical information can be derived instantly from imagery (Gerke & Kerle, n.d., p. 33). With improved oblique high resolution imagery now being collected by commercial companies and the current ability of unmanned aerial vehicles to fly in theaters of operation or natural disasters this technology needs to be fused together and provided to first responders and armed forces currently engaged in combat. Military personnel have requested this capability and professionals in the imagery industry have recognized this as a deficiency in service. This technologically possible product would increase the safety and effectiveness of our emergency and military personnel. It can be collected in real time and transported to the users who need it most saving precious time for those risking their lives in dangerous situations both at home domestically as well as overseas. Corbley, K. (2011). After the deluge: Fast image delivery helps Nashville respond to historic flooding. Earth Imaging Journal, 8(6), 24-27. GE Intelligence (2012). The power of extreme analysis. 2(4) 28-31. Geospatial Intelligence Forum (2013). Improving acquisition and solidifying the IT organization. 11 (1) 17-19. Romanowich, J. (2013). Best practices for securing airport perimeters. GSN: Government Security News, 11(1), 13.